Artículo ​​# 309004 Puntos Stash: 295 (?) This is the number of points you get in The Zumiez Stash for purchasing this item. Stash points are redeemable for exclusive rewards only available to Zumiez Stash members. To redeem your points check out the rewards catalog on thestash.zumiez.com. Añade un poco de humor a tu portátil, tabla de skate o lo que elijas con la pegatina Open925 Wok This Way. Esta pegatina adhesiva presenta un dragón con un texto que dice: "wok this way, all that and dim sum". Wok This Way pegatina de Open925. 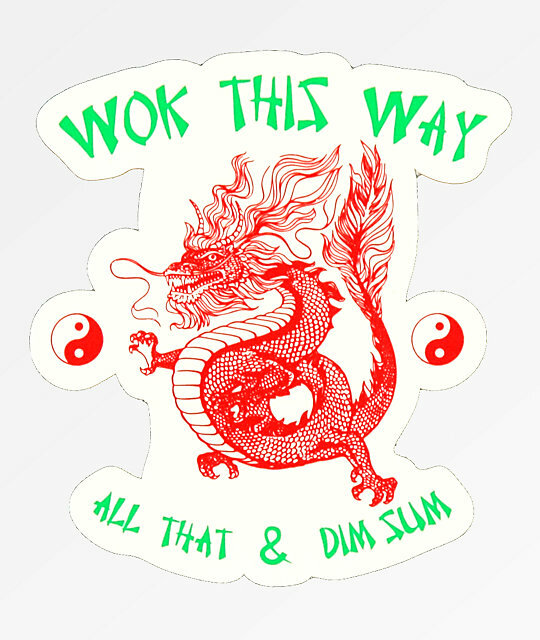 Diseño recortado en rojo, verde y blanco con "Wok this way, all that and dim sum" en letras verdes. 3.5" x 3.5" | 8cm x 8cm (aprox. ).